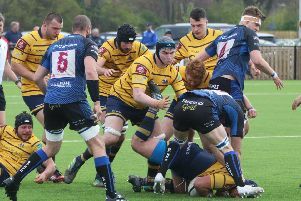 Ian Davies is hopeful Worthing Raiders can finish an improved National 2 South campaign on a high. After surviving relegation on a tense final day last term, Raiders already have 11 points more than what they managed to achieve in the whole of last season - with four games still to go. Worthing were without a fixture last weekend and return to action at third from bottom strugglers Old Redcliffians on Saturday. Davies (Raiders high performance team manager), Jody (Levett; head coach) and Ben (Coulson; assistant coach) came together at the start of last season but endured a tricky first campaign as a trio. Staying up on the final day just over a year ago appears to have made both them and the team stronger. Raiders’ run-in sees them come up against three of the current bottom five - all away from home - in their final four matches of the season.